I came across this, well not quite surprising, phenomenon while preparing a class on nonhuman connectivites and their anthropological explorations. More than simply the interspecies beauty of the fact that bees see flowers differently from humans (as if humans saw them all in the same way), it is on an entirely different level that it strikes me as something extremely powerful. It is indeed a great example of how being in and knowing about the world hang together not in the semiotic ways Eduardo Kohn tries to convince us, but rather in the simple technological practicalities of scientific curiosity. The remarkable eyesight of bees has long been a source of fascination in the scientific community. A hundred years ago, Nobel Prize-winning scientist Karl von Frisch proved that bees can see color. The color we see is based upon how a pigment absorbs and reflects light. When light hits an object, some is absorbed and some is reflected. Our eyes perceive the reflected portion as color. The brilliant color in flowers is a way of attracting pollinators, such as bees. The colors of flowers help target the areas of nectar. That’s the reason why petals are usually a different color than leaves. Even though humans can see more colors, bees have a much broader range of color vision. Their ability to see ultraviolet light gives them an advantage when seeking nectar. Many patterns on flowers are invisible to humans. These nectar “bulls-eyes” are visible only to animals, such as bees, that have the ability to see ultra-violet light. This “bee vision” makes finding nectar much easier. In fact, some flowers such as sunflowers, primroses and pansies have nectar guides that can only be seen in ultra-violet light. So, yes, humans would like to know more about the lives of bees, which has a lot to do with how they see the world, more concretely flowers. Whether scientists are right about this or not is not really a matter (from a different angle on this issue, see e.g. Evans-Pritchard 1937). What matters is that flowers are quite real and one aspect of their reality is their colour, which may be sensed and processed differently by bees and humans, but may also be commensurated by special cameras, in a cognitive, that is ontological sense. 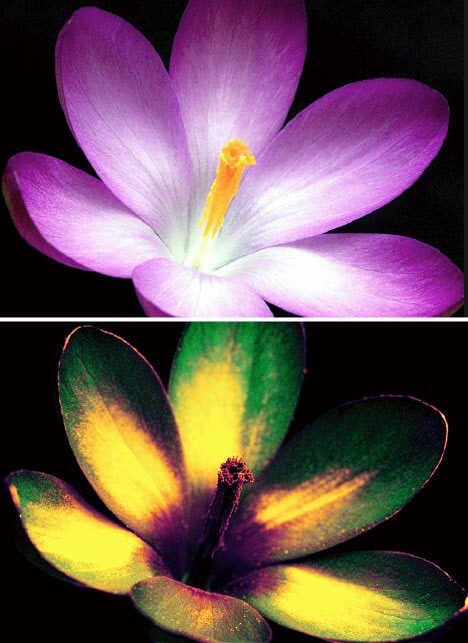 Flowers in ultra-violet are becoming a reality of human existence, once they help us to understand bees and foster new ways of living together with them (which may also mean for some to exploit them). But this is exactly why and how realities and knowledges of the world are inherently related. And then, of course, there are sounds and smells, or other, partly unimaginable, senses of which we know close to nothing; there are microbes, viruses, and yet to be discovered galactic scales that defy all our devices of measurement, quantification and imagining. I wonder how narrow minded one has to be to think that ours is the only possible world to be/to know?